Visit Vacaville Quick Lane when you want the best price on a new set of tires for your car, truck, CUV or SUV. Looking for an expert tire rotation or tire inspection? We’re here for you. No appointment necessary.When you purchase a new set of tires, you’ll get expert care from us including a complete tire inspection for proper inflation and wear, tire rotation, new tire installation, tire mounting and balancing. Our factory-trained experts can also help you get the most out of your tires by providing you with simple maintenance tips. All it takes is a penny! Put one upside down in your tire’s tread grooves. Put a penny in several locations since your tires may display inconsistent wear patterns that lead to premature wear. It’s a smart idea to inspect your four primary tires and spare tire once a month. If Lincoln’s hair is visible, the tread has worn to less than 2/32 of an inch. Use a tire depth gauge to give you a better indicator of how much tread you have left. It is strongly recommended that you replace your tires when the tread has worn to between 2/32 or an inch and 4/32 (using a quarter instead of a penny with Washington’s scalp visible). Punctures, cuts or snags in your tire tread or sidewall could also signal that it’s time to replace. The more tread on your tires, the more control you’ll have – especially in wet road conditions – and the shorter the distance required to stop your vehicle when braking. Spotting uneven and irregular tire wear patterns. With regular driving, tires inevitably wear out. But some types of wear are premature and the result of improper tire inflation and external factors. The experts at Vacaville Quick Lane can point out any unusual wear patterns on your tires and show you how to how to fix the problem. You can find the tire size information for your vehicle in your owner’s manual or on the driver’s side doorjamb. This information pertains to the original equipment (OE) tires. Make sure that your tires are the correct size(s) and have the proper speed rating (or higher) and load-carrying capacity. Only use the tire combinations outlined in the owner’s manual. Important: Your auto manufacturer suggests you equip your vehicle with the same type of tires and tread design as were originally equipped on your vehicle. 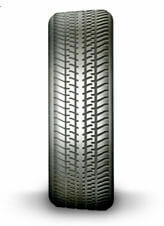 Today’s tires are built to help prevent flats, even if you drive over glass or other objects that could pierce the tire. But you’re still not guaranteed of not getting a flat. Consult your owner’s manual about changing a flat tire. If you have a spare tire or inflation device, it should be suitable to your vehicle. Always remember to inspect the spare when you get replacement tires and when performing monthly air pressure inspections. In addition to making sure your tires are properly inflated at the recommended levels, rotating your tires can help you get the most miles out of them by distributing wear more evenly. 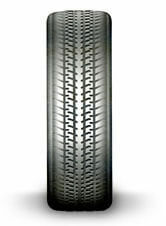 While rotating the tires, any unusual tire wear patterns can be exposed, indicating premature tire wear and external factors. Related components such as brakes, suspension and steering parts can also be examined for needed maintenance or repair. Consult your owner’s manual for frequency and tire rotation patterns. To make sure you are rotating your tires at the right time in their life cycles, ask an expert at Vacaville Quick Lane to inspect your tires. No appointment necessary. Maintaining the correct recommended tire pressure is not only important for safety reasons, but it can also help you get more miles out of your tires. To determine how much air your tires need, see your owners manual or placard, which is often located in the glove compartment, the driver’s doorjamb or inside the fuel cap door on 2002 and newer model-year vehicles. Don’t try to “eyeball” your tire pressure. Tires can appear fully inflated even though they are not at the recommended inflation levels. We suggest using the pounds-per-square-inch (PSI) recommendation in your owner’s manual instead of the numbers outlined on the tire sidewalls since these apply to maximum pressure for that tire. Check your tire pressure once every month. First, make sure the tires are cold and were not just driven. Invest in a tire pressure gauge. 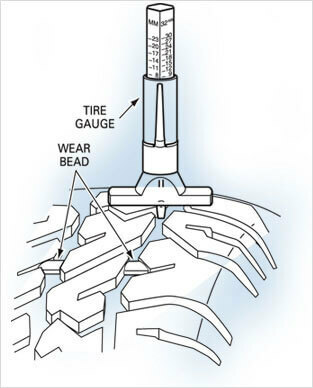 Unscrew the valve cap on the tire and press the gauge into the valve stem. Read the number on the gauge, compare it to the recommended level and add air if needed. Check the pressure on your spare tire, too. If you are uncertain about whether it is time to replace your tires, the factory- trained auto service technicians at Vacaville Quick Lane Tire & Auto Center can tell you if you need new tires. 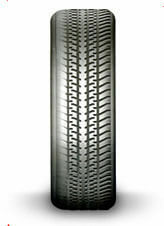 The tread wear grade is a comparative rating based on the wear rate of the tire when tested under controlled conditions on a specified government test track. A tire graded 200 would wear twice as long on the government test course under specified test conditions as one graded 100. 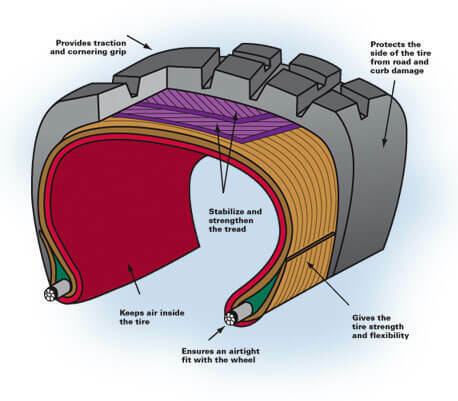 Tread wear grades cannot be used to project tire mileage since there are a number of variables that affect wear – driving habits, service practices, differences in road characteristics and climate. Traction grades – AA, A, B and C – go from highest to lowest. They represent the tires’ ability to stop on wet pavement as measured under controlled conditions on specified government test surfaces of asphalt and concrete. The testing does not take into account cornering, hydroplaning or acceleration. The temperature grades – A, B and C – go from highest to lowest, and represent the tires’ resistance to the generation of heat. While the ratings are established by NHTSA, the tire manufacturers and independent testing companies perform the actual validation testing. There can be some inconsistencies in testing and results. Federal law dictates that tire manufacturers place standardized information on the sidewalls. 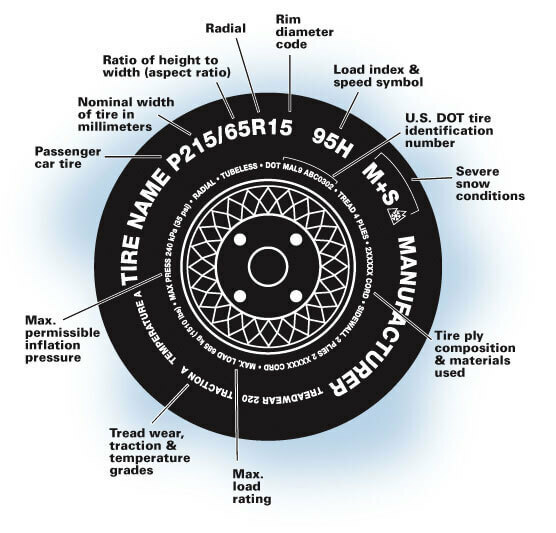 The information (letters and numbers) identifies and describes the basic characteristics of the tire and also provides an safety standard certification and in case of a recall. We’ll use P215/65R15 95H M+S as an example and explain the meaning. P indicates the tire is for a passenger car, while LT would be for a light truck and N would be for a spare tire. This is the width of the tire in millimeters from sidewall edge to sidewall edge. Typically, the larger the tire, the larger this number. 65 is the aspect ratio, which designates the tire’s ratio of height to width. Numbers of 70 or lower indicate a short sidewall for improved steering response and better overall handling on dry pavement. R stands for radial, as in radial ply construction. 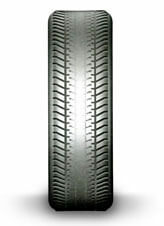 The rim diameter is 15 inches for this tire, meaning your replacement tire should also have a 15-inch diameter. The number 95 designates the load index, which tells you how much weight each tire can support. This information is available in the owners manual. Not all tires may have a load index since this is not a requirement. In this case, the tire can support 1,521 chart, available in Search for Tires. H is the speed rating, which denotes the speed at which a tire is designed to be driven for extended periods of time. The ratings range from 99 miles per hour (mph) to 186 mph. You may not find this information on all tires because federal law does not require it. NOTE: You should not exceed posted speed limits even if your tires have higher speed ratings. Also shown as M/S, this indicates that the tire has some mud and snow capability. Most radial tires have these markings.